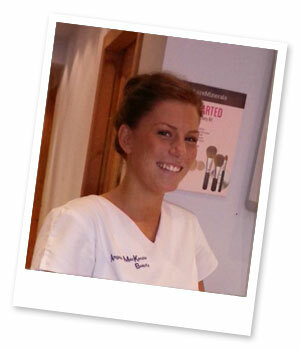 Bex is the newest member of the team, moving to Glasgow from Surrey in June 2010 (and “aye” she’s still surviving!). Trained in the London College of Fashion on Oxford Street, London; Bex graduated with a 2:1 Foundation Degree in Beauty, Science and Management. Formally working in Pennyhill Park Spa, a 5 star spa in Surrey in which she went on various different courses, learning many different types of massage; from building on her Swedish and aromatherapy massage techniques to learning Aboriginal massage. She worked here for 2 and half years, dividing her time between the spa and an award winning Dermalogica salon in her local town which she spent more than a year there also; becoming fully Dermalogica trained. Bex is also trained in nearly all aspects of the beauty industry most recently including advanced waxing; bareMinerals make up, Lash Perfect Eyelash extensions and Shellac Nails.